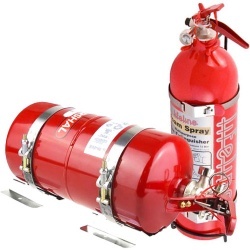 Save yourself some money with our fire extinguisher package deals, let's face it, you'll need both items when preparing your car, so do yourself a favour and buy them as a package! 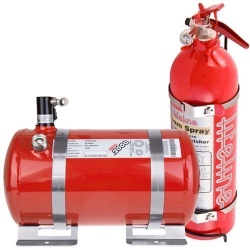 All these packages include a plumbed-in fire extinguisher kit and a hand held extinguisher. We offer products from Lifeline, OMP and others, all of which meet FIA and MSA regulations for motorsport use. Please check the regulations for the types of events you are planning to take part in, just to make sure your car will meet the requirements. We're fire extinguisher experts at MSAR, so please call or e-mail us to discuss your requirements, clear up any queries or confirm your thoughts! Call us on 0208 655 7877.